You can add users to Tableau Server one at a time or in batches. You can add them to the server as unlicensed users, and then add them to sites and assign site roles as you onboard them to Tableau Server. Or you can add users to sites and specify their site roles at the same time, at which point they are ready to sign in. 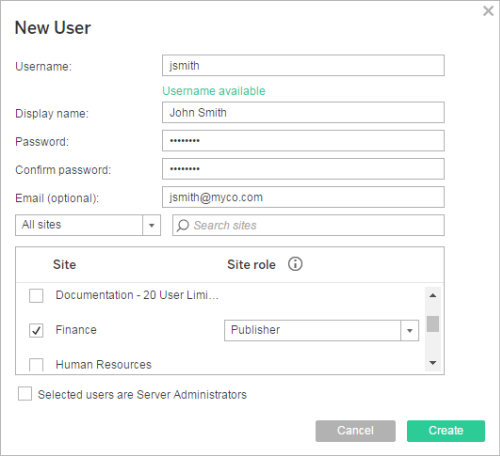 The steps below describe how to add an individual user and assign their site role. To add users in batches, you import them, providing Tableau Server with a CSV file that contains rows of users and their attributes. For information, see Import Users and CSV Import File Guidelines. If your Tableau Server is configured for Active Directory authentication, before you add users, review User Management in Active Directory Deployments to understand how multiple domains, domain naming, NetBIOS, and Active Directory user name format influence Tableau user management. In a single-site environment, server administrators can add users on the Users page. After you add a site to Tableau Server, it becomes a multi-site server with a Server Users page (all server users from every site appear here) and a Site Users page. Only server administrators can access the Server Users page, and both site administrators and server administrators can access the Site Users page. The Server Users page is the only place where you can assign users to multiple sites, delete users from the server, and if the server is using local authentication, reset user passwords. In the site menu, select Manage All Sites > Users, and then click Add Users. To add a user to a site, you select the site and go to the Users page. If the server is configured for local authentication, click New User, and enter a user name. With local authentication, the best way to avoid user name collisions is to provide an email address for the user name. For example, jsmith@example.com instead of jsmith. User names are not case sensitive. Characters not allowed in user names include the semi-colon (;) and colon (,). If the server is configured for Active Directory authentication, click Active Directory User. If you are adding a user from the same Active Directory domain that Tableau Server runs on, the server domain will be assumed, and you can type the AD user name without the domain. Note: Do not enter the user’s full name; this can cause errors during the importing process. Display Name—Type a display name for the user (e.g., John Smith). Password—Type a password for the user. Email—This is optional and can be added at a later time in the user profile settings. Selected users are Server Administrators: Specify whether the user should be a server administrator. Name (Site Membership) / Site Role: If the user is not a server administrator, you can assign a user to zero or more sites, along with a site role for each site. You do not have to choose site membership and site role at this time. If you don’t specify site membership and site role for a new server user, the user will be added as a server user only, with a site role of Unlicensed. For details, see Set Users’ Site Roles.